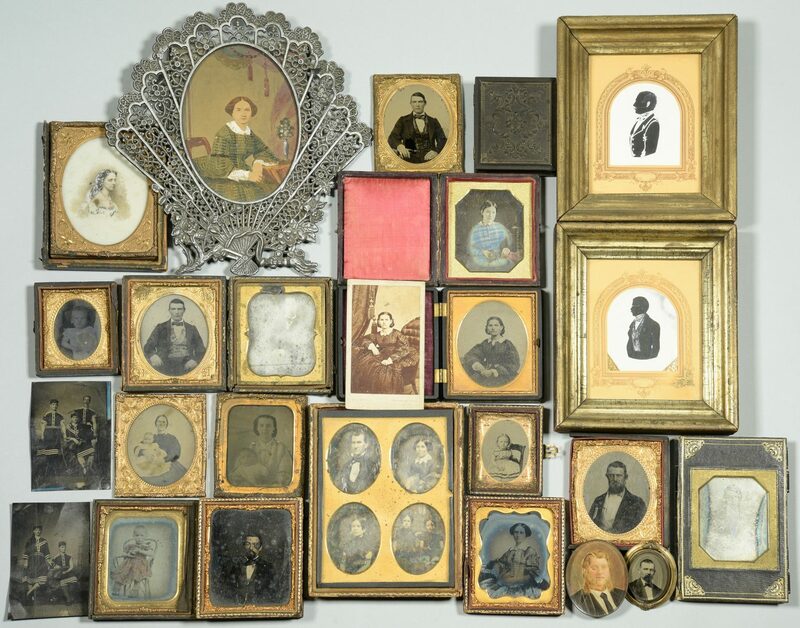 Group of early photographs of people, all believed to have some relation to the Davis-Hicks-Giers family of Nashville, but none positively identified. 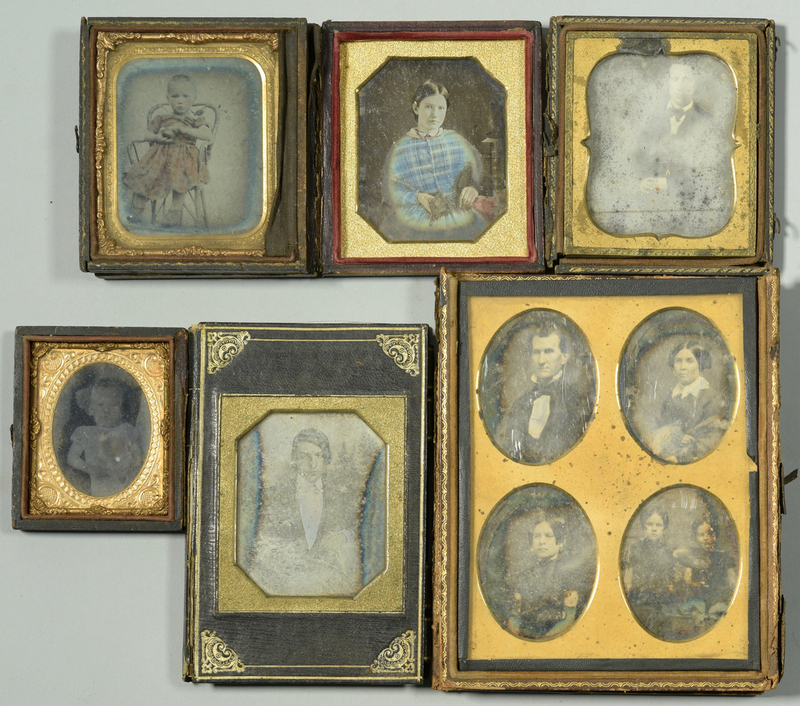 Daguerreotypes, ambrotypes, tintypes, silhouettes, and miniature portraits. 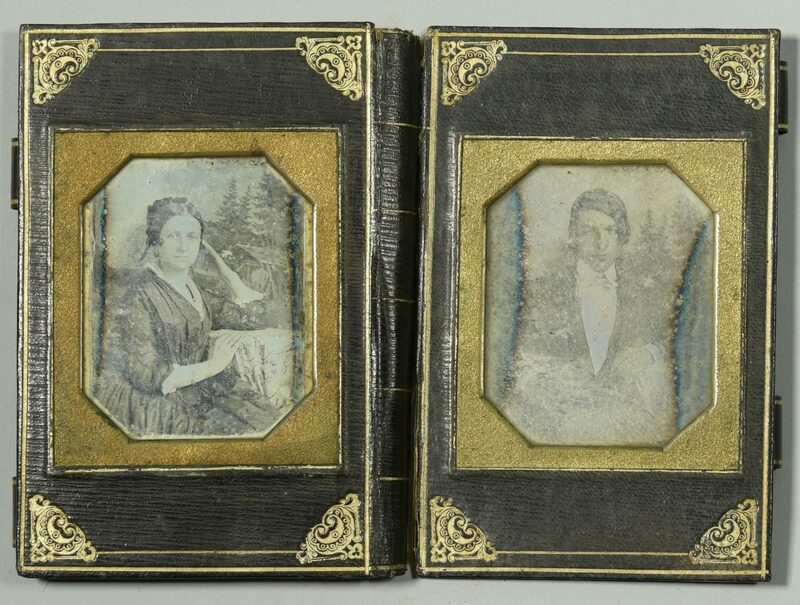 Includes a 6" x 4 3/4" union case with four 1/8th plate photos of members of a family; small leatherbound album with sixth plate daguerreotype of a young man on cover, blank pages inside; 11 sixth-plate size images of 4 women (2 are holding babies), 5 men (1 man is represented twice), and 1 toddler and 1 teenage girl (both hand tinted) ; 2 eighth-plate images of children; 2 tintypes of people posed in bathing suits, 3 1/2" x 2 1/8", and 1 CDV of a young woman in plaid dress (Giers label verso). 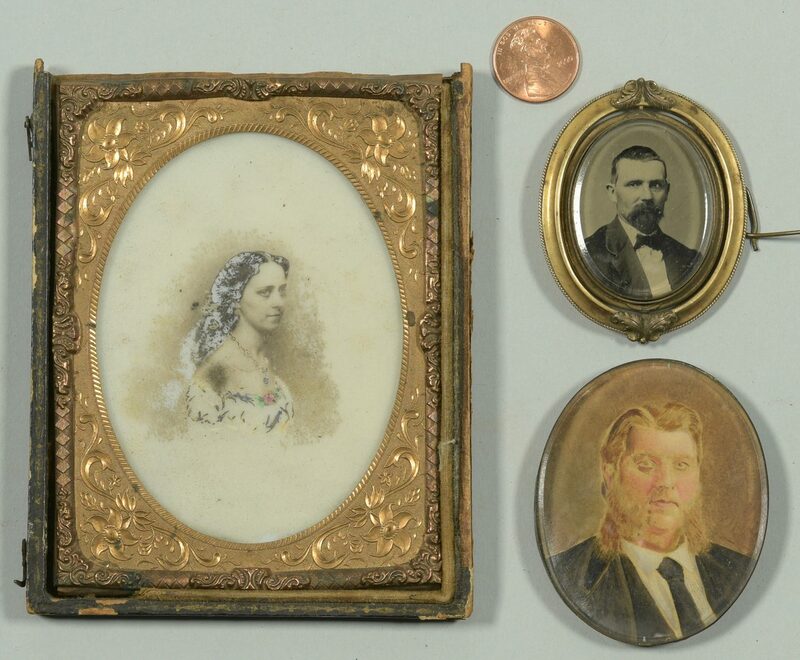 There is also a photographic print on porcelain or opaque white glass of a woman in mantilla and off the shoulders dress, (tentatively identified as Ida Hamilton Thruston), 3 1/2" x 2 1/2" (sight). Also included is a gilt metal portrait brooch with 2 revolving images of a bearded man (2" x 1 3/4" overall), an unframed watercolor on paper miniature portrait of a man with extraordinary sideburns 2 3/8" x 1 7/8"; 1 watercolor on paper portrait of a woman in circa 1860 plaid dress seated at a table with vase of flowers, 5" x 3 1/2", in contemporary fan shaped frame 9" x 8"; 1 empty eighth plate union case; and 2 silhouettes of men in waistcoats and jackets, ink on paper, each with decorative border in an antique giltwood molded frame, both with illegible writing en verso; one says Giers; 6 1/2" x 5 1/2". 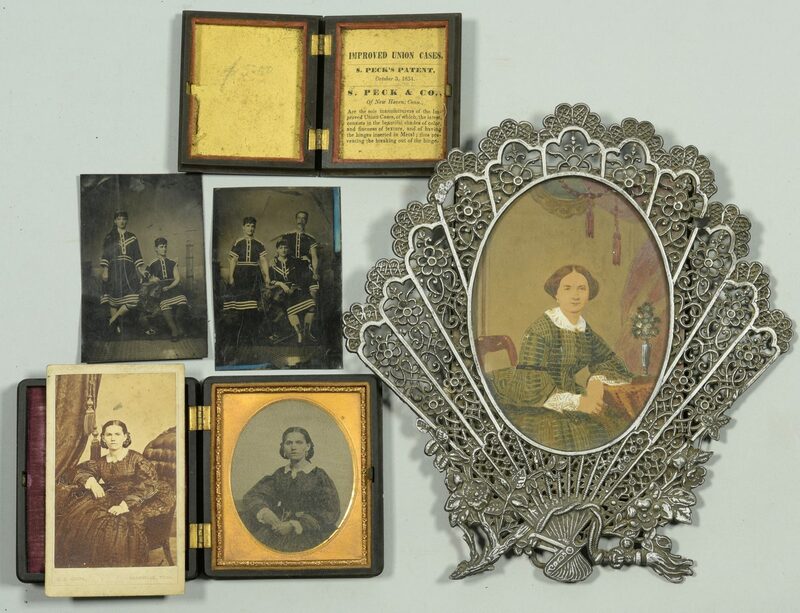 Provenance: the estate of Sarah Hunter Hicks Green, formerly of Historic Devon Farm, Nashville, Tennessee. CONDITION: Family photo – case covers separated, father's photo has slipped in frame, some with deterioration around edges. 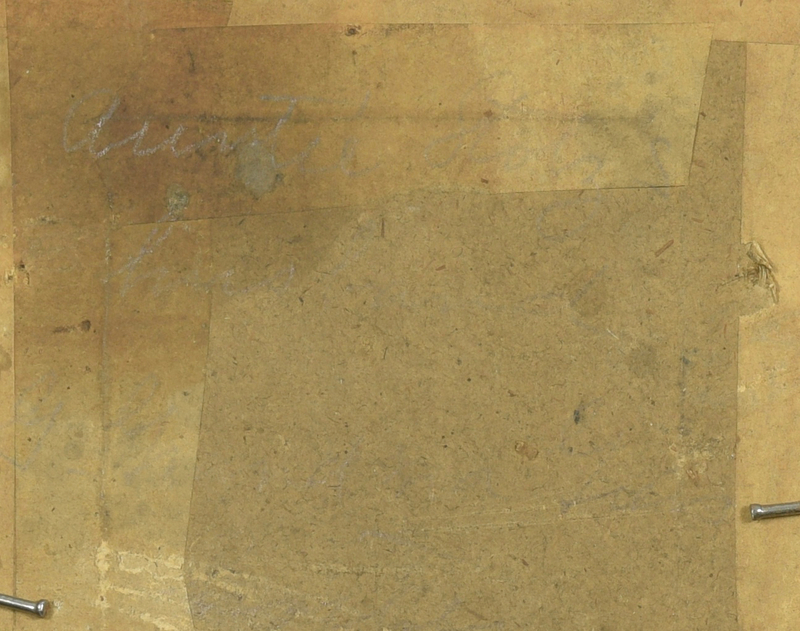 Sixth plate images have scattered degradation, especially image of dark haired bearded man on face, and young man on notebook cover. 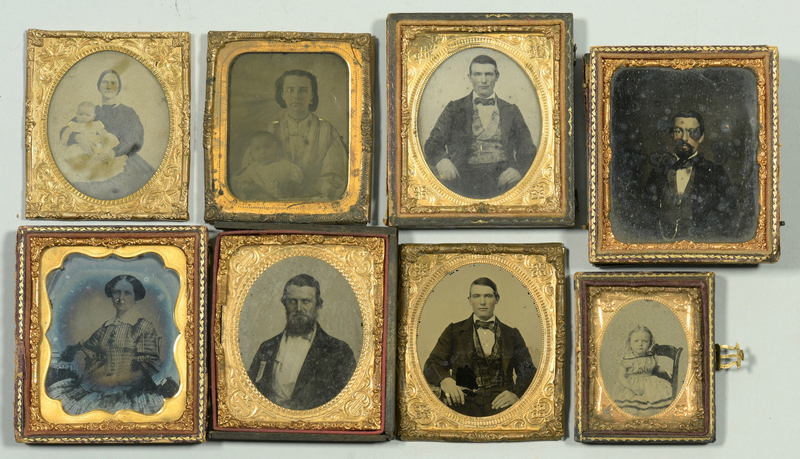 Tintypes have some abrasions, especially at edges. 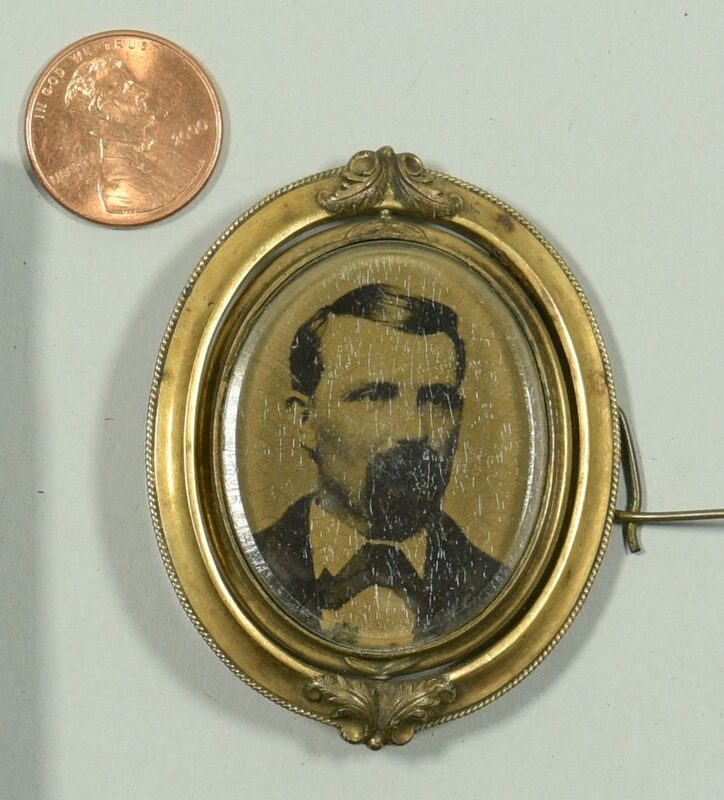 Image of woman on opaque white glass has spot of discoloration on shoulder. 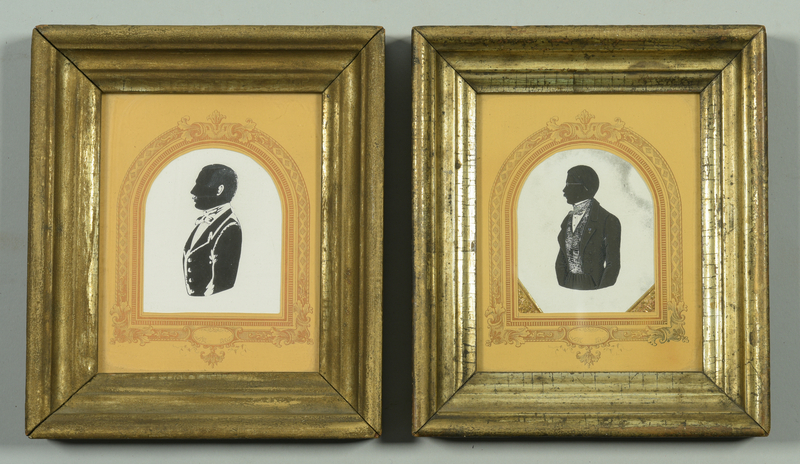 1 silhouette has staining to upper image, both have wear to frames. 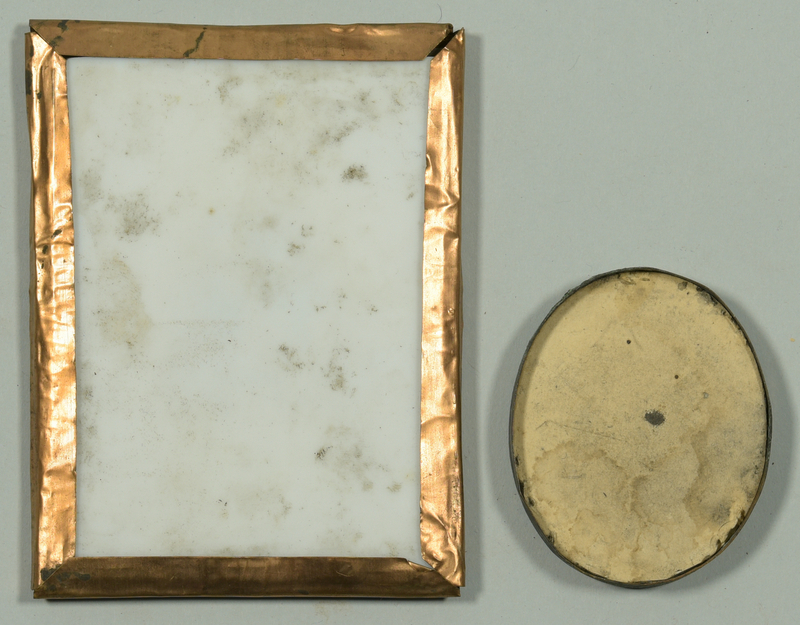 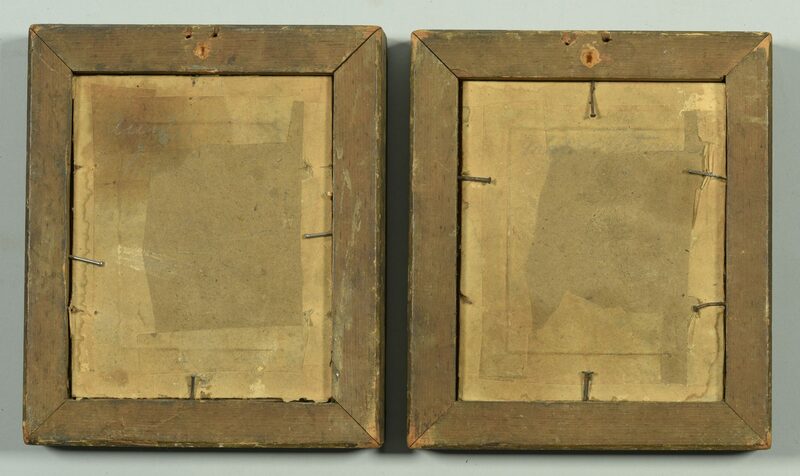 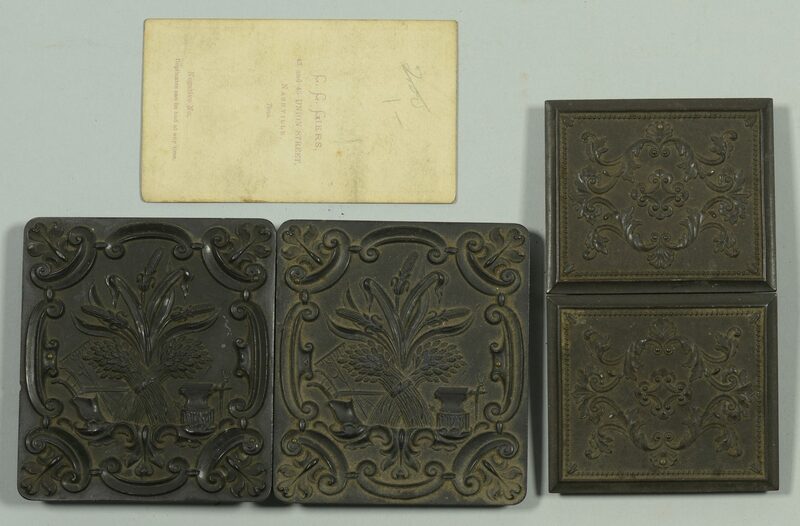 Most sixth plate photos lack covers to their cases and two do not have cases at all.